Bayern Munich defender Thomas Isherwood will return to Auchenhowie next month after he impressed on trial from the German giants recently, to continue to attempt to win a deal under Steven Gerrard. The 20-year old Swedish stopper is a youth international for his country, and has been a regular for the Bavarians’ reserve sides in the form of Bayern Munich U19s and Bayern Munich II, with 37 and 18 appearances respectively. Rangers are in dire need of quality centre backs, and while Isherwood may be young, his qualities are apparent with a 6ft 4 frame that aerially dominates, composure on the ball and left footed orientation. 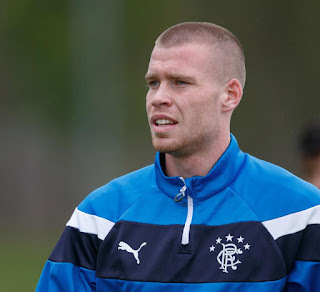 The Swede has recently been a target for Celtic as well, but his trial with Rangers suggests Rangers have stolen a march on the youngster and if he continues to impress he could well seize the contract he keenly wants. Get him signed. Won't cost much, so we can cope with the gamble, but if he makes it then it's a better buy than Skrtel. No downside, big enough to cope with Scottish football. ...Cant be any worse than Kiernan! And Since he is Coming from Bayern hes Obviously Good Enough for Us. Until then,, stop speculating like the rest of them!!!! What you talking about. He's been at Rangers in trial. Can't get clearer than that in terms of the club expressing an interest. And yeah we need experienced CB but we also need back up and to be developing younger players to step in if we sell. I agree we need 2 experienced CBs, but what if one gets injured? Halliday? No. We also need young CBs, as good as we can afford, to develop and sell on or replace the older ones as their performance drops with age. We have a young guy, Wilson, already and we need at least 2. McCrorie may be another or he may move further forward. Either way, you probably need 5 CBs, 2 experienced and 3 young to develop. We have Alves if he doesn't move on and are clearly looking for another. But we must also look to the future by bringing in youth. According to what Ive been told he impressed everyone on that trial, except one man Stevie, he wasn't there to impress. Stevie will assess him on the second trial. Everything changes next week, hard to do absulutly anything from afar. Jimbo points out we need 2 experienced CH. Don t know if we need 2 but 1 who has ticked every box is a absulte must. And I mean captain material. Im sure if Jimbo & I know that Stevie certainly does. Ì disagree . Alves and Martin were two experienced centre halfs as was Danny Wilson .Fact was they were pish though. If he is good enough get him signed. Look at that mob with Van Dijk. Sounds good but why did they not follow up on him?,it looks like everyone buying players are going after players that BR runs his eye over i hope we are not buying a BR average type we have too many here as it is ,its easy to have impressed on trial and another thing getting in the team and playing week in week out,i will say he could be a good buy only time will tell. I think this could be a good signing along with an experienced CH can grow into a better player . Steven Gerrard will ask whoever's he needs to ,to get what we need to win this league . 20 year old ...German coached ..6ft 4 ...no brainer remember it's about winning this League.